The lat pull down machine is a great machine primarily used to work the latissimus dorsi muscle or better known as the "lats". Lats are a pair of large fan-shaped muscles that run across your middle and lower back, attaching your arms to your spine. Many variations can be performed using the lat pull down machine by simply adjusting your grip on the handle bar or changing the handle bar. This move focuses on the traditional lat pull down movement. Stand, facing the machine, using both hands, grip the handle bar. The position of your hands should be slightly more than shoulder width apart. 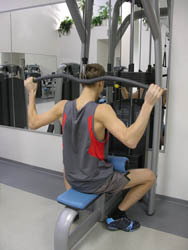 Pulling the handle bar downwards, extend all the way down until you are seated, arms stretched out above you holding onto the bar. Ensure that your legs are positioned underneath the leg pads, feet flat on the floor. The leg pads should be against your upper thigh; if they do not touch, adjust them. DOWNWARD MOVEMENT: To begin the movement inhale and pull the bar down to your chest. Make sure that your back is straight and does not arch unnecessarily. Expand your chest and pull your elbows backward. UPWARD MOVEMENT: Exhale and allow your arms to straighten out to the starting position before going for another repetition. These are performed using a triangular shaped bar instead of a straight bar, and your palms face each other. This move focuses on the teres major and latissimus dorsi muscles of the back together with the biceps brachii and brachialis of the upper arm and brachioradialis of the forearm.